“Look at that bird that is hovering in the air like a helicopter,” I told my friends as we edged along the Farm-Market Road near Luis Lopez. Before I looked at it through my binoculars, I assumed it was a Say’s Phoebe. 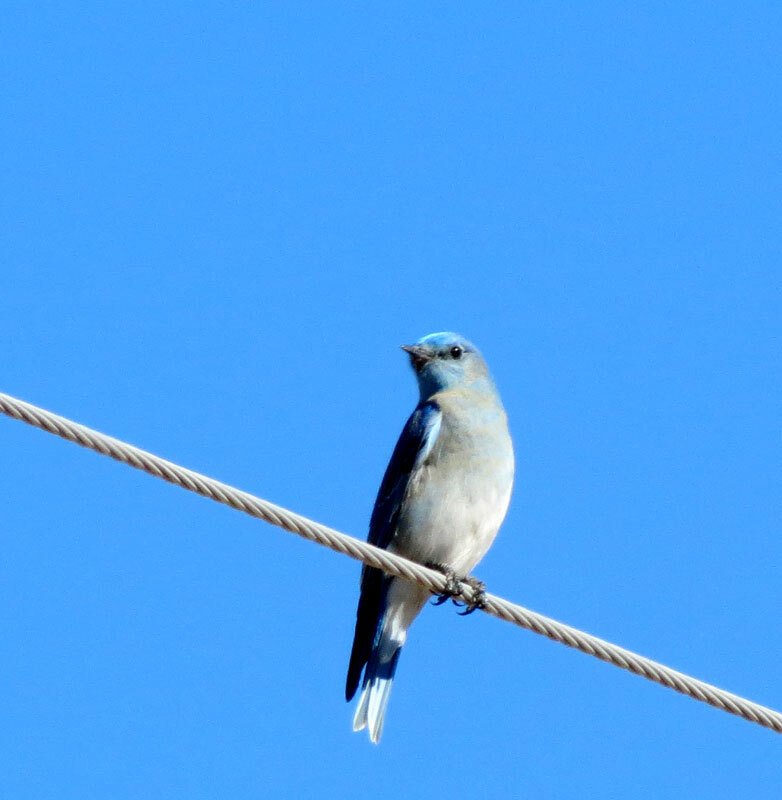 “It’s a Mountain Bluebird,” I exclaimed. 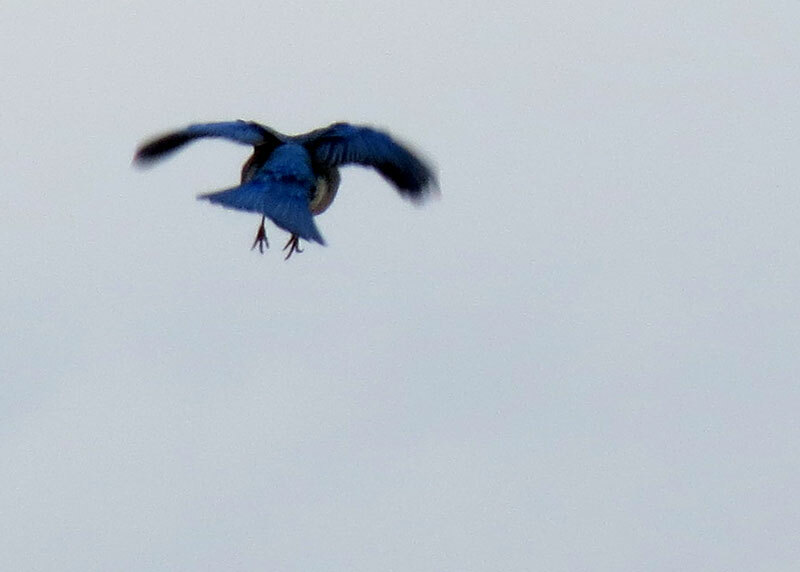 I had never seen a bluebird hover for insects before. In addition to my friend and co-author Barbara, our birding party included Kathy who had only been in New Mexico for about 3 months, as well as our friend Jan.
“I can see a bird with my eyes, but when I try to find it in my binoculars, it disappears,” Kathy disparaged. “I can see it!” she squealed excitedly. Mountain Bluebirds seemed to be everywhere in the dried farm fields. And, when we looked closely, we discovered there also were Western Meadowlarks that blended in with the field as they bent over. “There’s an American Kestrel,” I pointed out. Everyone got their binoculars on it, admiring its striking coloring. 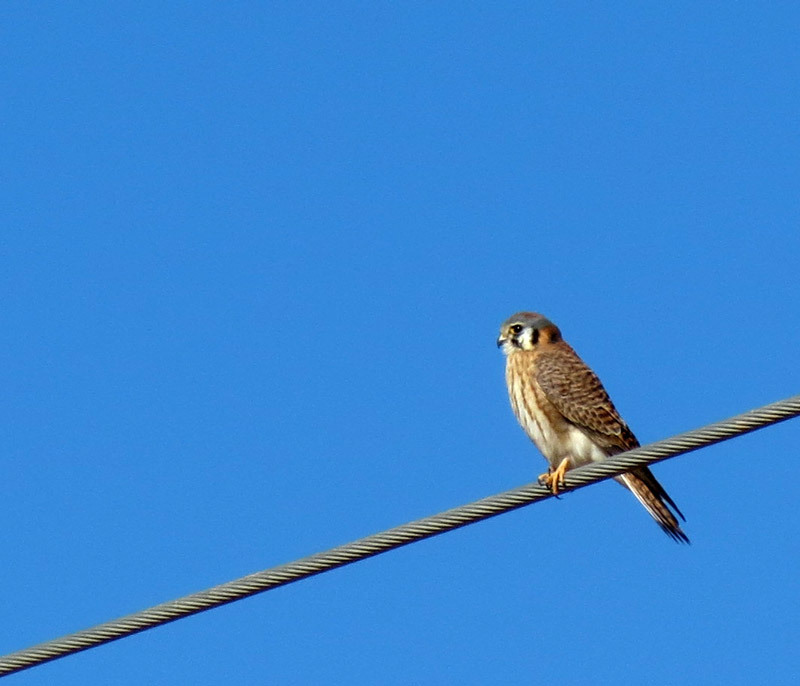 It was the first of 5 kestrels we spotted on our way to San Antonio. We were surprised to find a Steller’s Jay along the route. After crossing NM-380, we pulled over to look for the rare Palm Warbler that had been seen foraging with Yellow-rumped Warblers since mid-December. Before I got out of the car, I saw it standing on a sawed-off stump pumping its tail. And then it hopped off and disappeared. “There’s a Phainopepla,” Barb pointed. “It has a crest like a Cardinal,” Kathy said. Across the road, a Greater Roadrunner emerged from the ditch and looked us over. After getting in the car, we noticed a flock of Yellow-rumped Warblers – and with it the Palm Warbler – giving the others an opportunity to see it. After lunch at the Owl Café, we headed towards to the refuge. As we approached the first pond along NM-1, we noticed a large raptor circling overhead and pulled over – an immature Bald Eagle. We stopped at the Visitor Center to check the feeders. 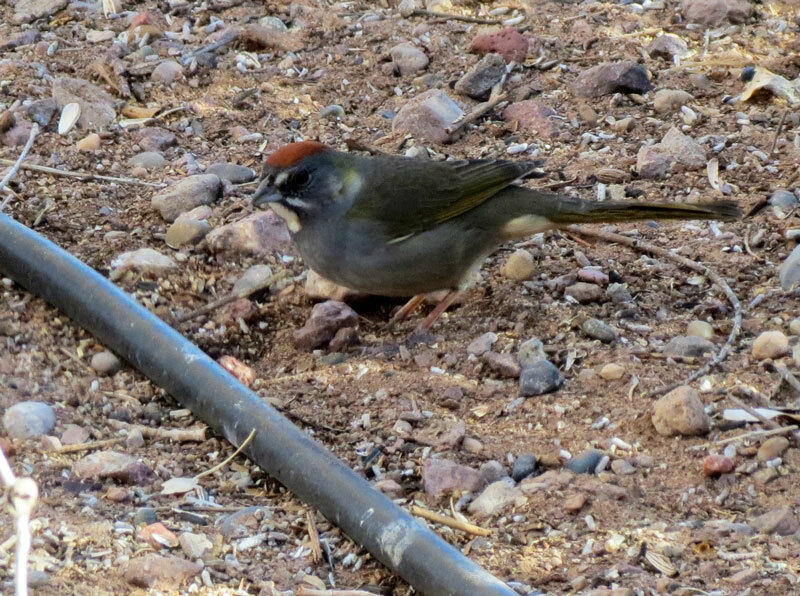 While we didn’t see the Golden-crowned Sparrow that had been reported, we were surprised and delighted to see a Green-tailed Towhee scratching in the dirt. Kathy was excited to see two American Goldfinch and to learn that they lose their bright yellow color during the winter. 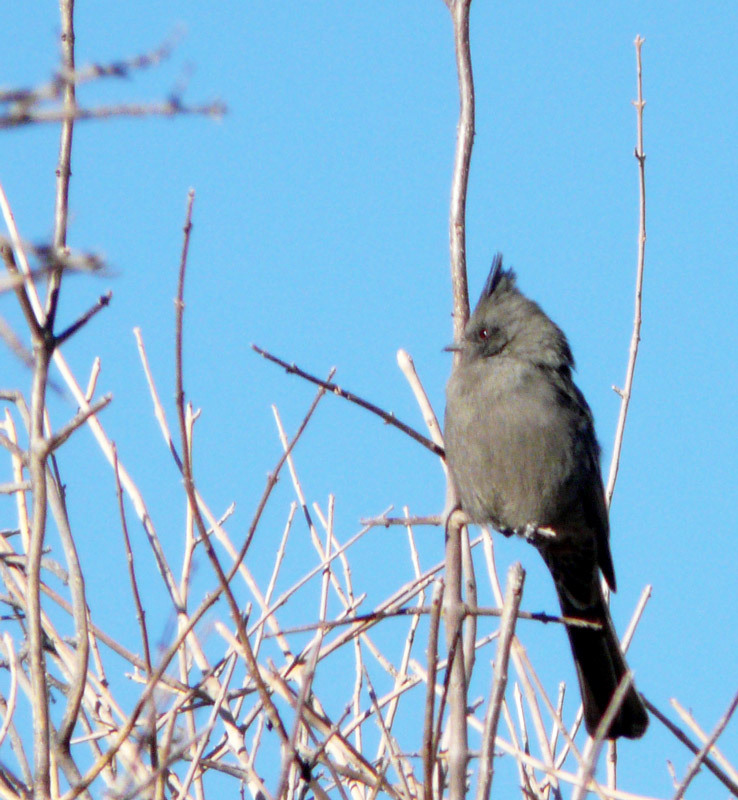 We wandered over to the garden to check out the birds and were pleased that a Pyrrhuloxia flew in and perched on a bare tree limb. Unfortunately, we were looking directly into the sun, so its colors didn’t turn out very well in my photo. While I lagged behind, the others saw a Gambel’s Quail family group cross the path near them. It was late afternoon by time we started along the Marsh (re-named South) Loop. We stopped along the side of the road several times to look at the ducks, pointing out Northern Shovelers, Northern Pintails, a Bufflehead, and Mallards. Jan spotted a male Cinnamon Teal. 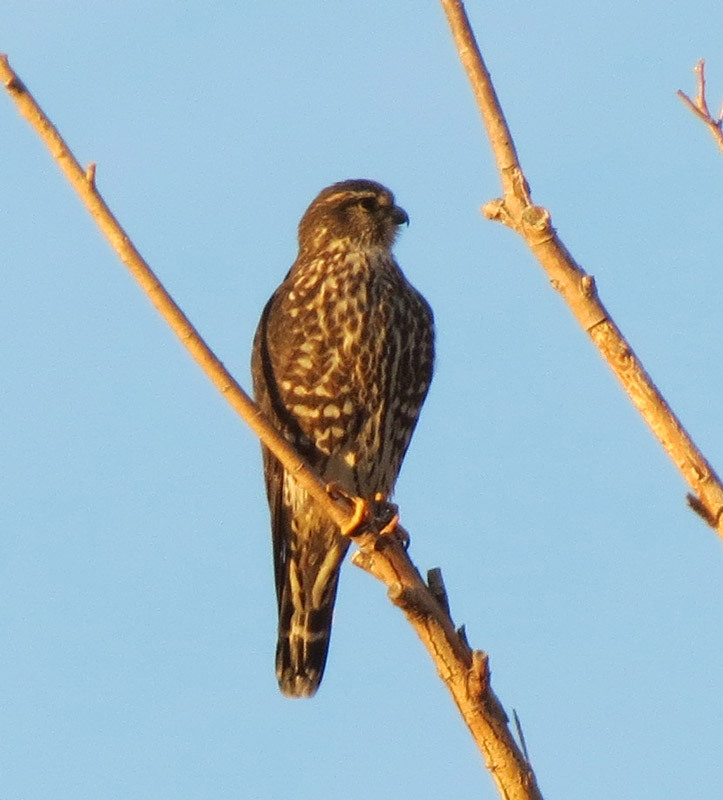 We stopped to check out a raptor – a Merlin. As we walked out on the Boardwalk, we noticed several Ruddy Ducks – still in their winter plumage. On the far side was a large raft of Lesser Scaup. 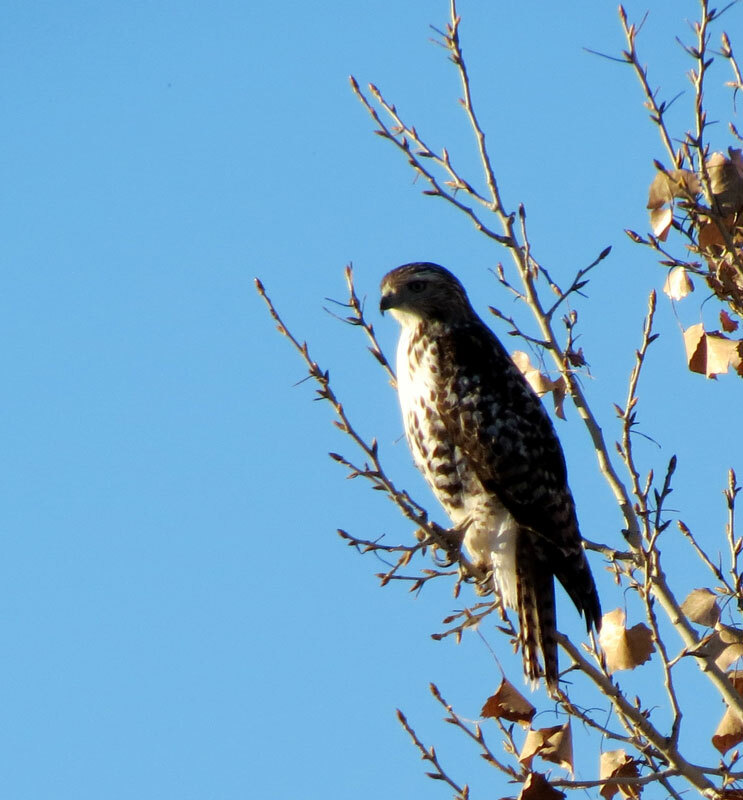 As we drove along the Farm (North) Loop, we stopped to check out a raptor perched at the edge of a tree. While it had a dark head, it also looked like it had feathery legs. The streaking at the edge of its belly was not well-defined. “It’s a Red-tailed Hawk,” Barb stated suddenly as we were deliberating. It had moved its tailed and she could see the red. We spotted at least six different Red-tailed Hawks in the refuge. At the north end of the loop, we stopped to watch the Snow Geese and cranes as they finished their end-of-the-day feeding and then headed into the middle of the refuge for the night. A Bald Eagle was perched strategically on the edge of a tree adjacent to the fields – watching. We arrived at the first pond north of the Visitor Center along NM-1 just before dusk and watched the geese and cranes flying in for the night. We kept the windows open so we could enjoy their calling and murmuring. At dusk, it appeared that they had all settled in for the night. 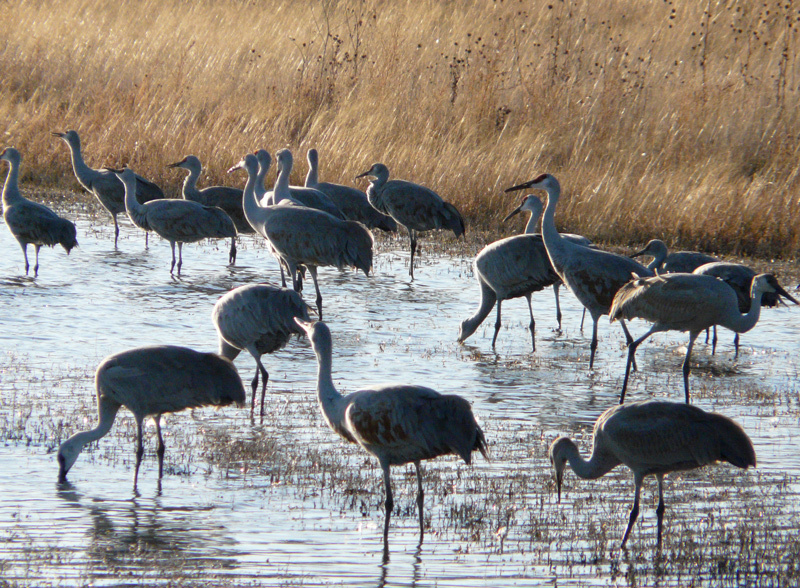 However, as we pulled out onto the road, we saw wave after wave of cranes still streaming in and landing in the northernmost pond. We pulled over across from the pond to watch the final landings. It had been a delightful day sharing the Bosque with my friends. It’s great that you saw the two birds that “begin with P and have a crest for all to see.” As a kid in NJ they seemed so exotic that I never even tried to pronounce their names. 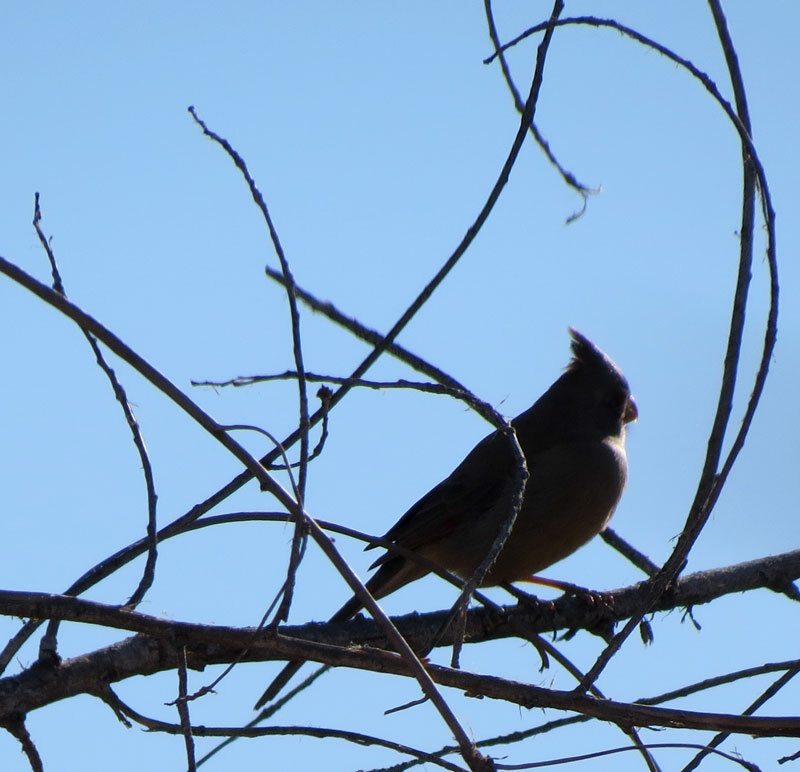 Nice day at the Bosque and glad that Kathy isgetting such a fine introduction to New Mexico birds and binoculars. What a lot of birds you two rustle up!